Now available in Reclosable Bags! Our Giant Cashews are the biggest, the freshest, the tastiest and the best. They are oil roasted in small batches the old fashioned way and are available salted and unsalted. These 160 count Brazilian Giant Cashews are the cashew connoisseur's dream. It takes talent to roast them to perfection, something we have been doing since 1929! Try Them. Giant Whole Cashews - Reclosable Bags - Net Wt. 16oz. Bought as a gift, recipient said delicious, have bought previously, would buy again. Good item. But shipping is too expensive! Best cashews anywhere. But pricey!!! Excellent product. But. Can we get free or reduced rate shipping? I bought these cashews as a Christmas gift for my brother who loves cashews. I sent them to him last year as well and he said they were excellent. These were lots better than the last shipment. I have purchased for years and never had any issues til shipment before this one. The cashews were burnt... I had decided that I wouldn't purchase them again from the company because I contact d them and they never offered to let me return or I'm sorry what could we do.. I don't really know why I ordered again except a creature of habit.. but I did think if these were bad I defiantly wouldn't order again. Good quality, flavor and size. I've only had these giant cashews once, but they are delicious and I won't hesitate to order them again. ProsThey are everything you expect of fine cashews. Great giant nut the cashiers. Gave them to my son for his birthday and he has really enjoyed them. These are absolutely the best (and the biggest) Cashews I have ever had! Loved them! I buy these for my wife and she loves them. The size and flavor are just awesome. I bought 4 lbs and she's already torn through 2. Be ordering more soon. We received a tin of these cashews for Christmas last year and loved them! I came across the red tin this year and the company sticker was still on it, so, I looked it up and ordered two bags of them. You won't find any finer. Biggest cashews ever. I have been ordering from the company a few years now. This year, I placed my Christmas order to give as gifts. I ran out, but ordered more just a few days before Christmas...never thiought I would get them in time. The box came on Christmas Eve. Wow! I "m impressed. Customer service beyond the call of duty...and at regular shipping cost!!! ProsGreat product an customer service. I buy these for my husband, and he really loves them. They are so much better and larger than store-bought. I will continue to buy them for him! Absolutely delicious! The best cashews we have ever tried! ProsVery large cashews, full of flavor! One Of The Best Cashews I have Ever Had! The flavor is excellent. The size is Very Large! It's the 2nd largest cashew I have ever had. I ordered un-salted by mistake & tried them. To my surprise even they were delicious. The company offered to take them back & exchange them but it would not have been worth it due to all the shipping charges, which they wont refund. I still prefer salted so I put them in a gallon size zip lock bag with a little oil moved them around to coat them then spread them out on cookie sheet & lightly salted them. I baked at 350 for 8 minutes & they came out fine. Not quite as good as factory salting but close. I cant wait to order again only next time I will make sure I get salted. ProsLarge size & Excellent flavor. ConsA tad pricey. Especially the freight. I bought two one pound bags and once I opened them they didn't last long. All my guests enjoyed them as they were bought for the holidays. I was really surprised at the size. They were giant and the taste was "Superior "
These Giant Huge Cashews are great and very tasty. Got a great sale price on them, even better. I shopped around long time ago and found Superior Nut Company to be the Best, and been with for some years now. You can not go wrong with there Nuts and Candy's. I shopped Bulk, this is where you get the great prices. I bought 2 of these last Christmas for my husband. Will buy every year and probably more frequently. Thanks Superior Nut. Everyone loved these large cashews. I had company and I put the nuts in a large bowl and they picked on them for the whole time. Father Said The Cashews were "Absolutely Delicious"
Purchased this as a gift for my Father. He called me and was thrilled to receive the gift and told me that the Giant Whole Cashews were "absolutely delicious". ProsI used Economy Shipping and the order was to be delivered on 8-31-16. The order was received 5 days early. That was wonderful. The giant cashews are great tasting but when you are paying extra for "giant" size cashews and most of them arrive in pieces due to soft package mailing it is very disappointing. I Have ordered these cashews several times and there was only one time they were not crushed and that was when they were nicely packed and shipped in an actual box. Please use a box when shipping these so customers can actually enjoy the "giant" cashews! These cashews are the best I have ever had. I had to try them because of all the five star ratings the reviewers gave them. They are five star worthy. These make a wonderful gift for anyone who loves cashews, but you are going to want a bag for yourself. Excellent high quality product, with great taste. Don't understand what you are asking? And the people are so nice if there is any problem. These are fantastic, but a bit pricey. I had received some of these in the past as a gift and finally found out where they came from. I'm addicted! these were huge but I have ordered from other companies and they have been better tasting! These were a gift but she was really wowed. By Christine Farris is handing out FREE SAMPLES! Did not disappoint for gifts to friend (& myself) a-one quality--will order again! Outstanding! Great taste. High quality. These cashews do not taste like all of the others you have eaten. They have more flavor and aare wonderful to eat. I've given them as gifts and everyone comments about how good they 'were'... Superior Nut Company does a great job and the Giant Whole Cashews are to die for! Gave as a gift - person receiving it said they were great! The giant cashews arrived quickly and are absolutely delicious. My father owned a business and before Christmas would place a large order with this company, all different kinds of nuts, to give as gifts. Still eating the cashews and can't stop, these are great tasting nuts. I have been ordering from Superior Nut Co. for years and so far have not found any other nut company I like. ProsWeb site, Shipping, tightly sealed bags. ConsCost is a little high, but worth it. Purchased for a friend who loved them. My order was perfect. Shipped on time, exactly what I expected and the nuts were perfect. The delivery was on the date they stated and packed so no nuts were broken. This is the third time we have ordered and our experience has been superior every time. Bought these for a friend, she loved them. Had an issue with shipping, contacted the company and they immediately sent out a new package instead of waiting for the post office to return the previous package. I didn't they grow so large and taste so great ! Why I love Superior nut company. Pros the freshness, quality and fast delivery. I've been a cashew lover since childhood, when I would sneak into my parent's secret stock and eat as many as I dared. I bought my first cashews at Morrow's Nut House in the mid-60s. They were my gold standard until I bought a bag of these giant cashews. They are -- hands down -- the biggest and best cashews I've ever eaten. Superior nuts are the best! ProsThey are big and absolutely delicious. I loved your cashews; they're the largest I've ever had and very fresh and crunchy. Bigger and tastier than I can buy locally. Price may actually be cheaper here.. 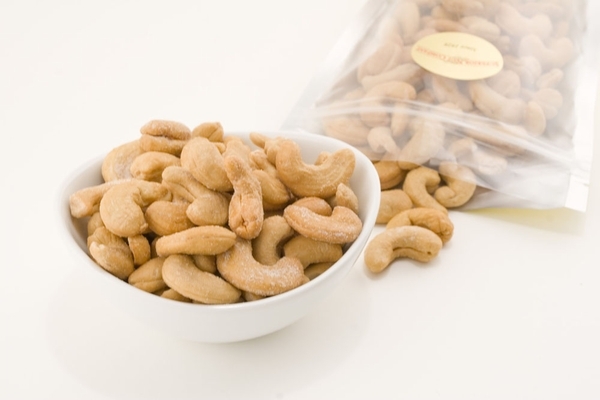 Ordered these for my mom, cashews have always been her favorite nut, out side of me. :) She LOVED them and they arrived quickly. Thanks, Superior Nut Company! These giant cashews are the largest we can ever remember eating. I will order some more later but without salt. I cannot review any other products as they are for gifts. I've been hooked on Superior Nut Company cashews for a very long time. You won't be disappointed. .. I haven't !!!!! Just placed another order of.... yes you guessed it. CASHEWS!!!! ProsLARGE... FRESH....ROASTED JUST THE WAY I LOVE THEM AND THAT RIGHT AMOUNT OF OIL AND SALT. Husband was wonderfully surprised on his birthday with the large, unsalted cashews that arrived earlier than expected. Being a cashew lover, I have tried many brands of nuts and these are far superior. ProsThese cashews are large, tasty and the texture is excellent. These cashews are the best! They make a great gift! Consistent, large, whole evenly salted and roasted cashews. Best ever. These are GIANT whole cashews (very few broken pieces) with an excellent taste. Would definitely order again. Those cashews are the best that I have ever had. They are really giants. Great as a snack or appetizer. I gave these as a gift and the recipient said they were wonderful. She lives in a nursing home and it is difficult to find a satisfactory gift for her. She loved these and suggested I give them anytime I want to give her a gift in the future. ProsThese cashews are very fresh and all my orders with this company have been exceptional. Giant Cashews? No - HUGE cashews and delicious!! Great quality and flavor. Hard to stop eating them once you start. These are the best cashews I have ever eaten. Big, salty and delicious. These are large and fresh tasting. -just what you would expect. Simply said, these are the best cashews I've ever had. Just wish they weren't so expensive. I ordered these for inclusion in our company's service award baskets for employees. The packaging was tastefully done which is what I needed for the basket. We opened one bag to see if they were of a good quality before we gave them out and found that they were fresh and tasty. I will definitely reorder from Superior Nut Company for next year's service award baskets. Shipping quick. Nice crunchy cashews. Bigger is better. If u really love cashews as I do u won't be able to stop eating these. They are so good I just reordered again. I am trying some other favorites this time around. I will let you know how these are too. ConsThey are gone before u know it. The very best! Will order more. ConsEveryone loves them! They don't last long enough. Perfecto. My dad loved them as a Father's day gift. Huge, great tasting cashews & they arrived very quickly. ProsMy husband loves cashews so this was a great gift for his birthday. The roasted jumbo cashews (unsalted) are probably the freshest and tastiest cashews you can get. We tried several sources and have settled on Nuts in Bulk as the best place to get cashews and nuts. Excellent jumbo cashews with very little salt...just the way they should be! I eat a handful every night to help with my intake of protein and also because they taste good. Greatest Cashews Ever . . . This was part of a first order ever with Nuts in Bulk and definitely NOT my last. I needed other nuts for holiday treats and saw the cashews. Since both my wife and I love cashews I thought that I would purchase a package for her and one for me (yes, we love them that much!). We were not disappointed, these like other items on the order were absolutely beyond our expectations . . . large, fresh and delicious. You can't ask for more. Oh, and packageing and delivery were both excellent and quick. Could not recommend too highly. If you love cashews I would highly recommend that you give them a try . . . you'll be spoiled for life. ProsPerfect . . . delicious, fresh, and the biggest ever! ConsThere is absolutely nothing to dislike except perhaps running out and having to wait for the next delivery! HUGE! Fresh, just the right amount of salt. Purchased for cashew brittle but the entire bag was gone the next morning! I've been buyiing your cashews since the 1980s. They continue to be a great product!!! Huge Cashews, great tasting, good price. ProsNice Huge cashews, like buying in bulk...good quality. Very good packaging. Dangerously addictive! Use caution when ordering. These cashews were huge, perfectly roasted, lightly salted, and had a great combination of crisp chewiness and freshness in the mouth. Fantastic! ProsTaste, texture, and roast were perfect. ConsFattening. Very fattening when you eat large quantities at one time. These cashews are just as advertised - - they are very big, fresh and taste great. I have ordered from several other online nut sites hoping for giant cashews and I was disappointed in all of them - - but not disappointed with nutsinbulk. I will order again. The nuts were a gift and were greatly appreciated by the recipient. The cashews are fantastic! What a great snack! ConsBags are too small.. I need a 5 lb. bag at a reasonable price. I'm skeptical of getting a 10 lb. bag---I think that's too large. I read through the reviews before I began buying from Superior and was impressed by the ongoing thread of comments about how the cashews were a level above anything else that had been tasted. I'd been searching for a premium nut supplier and was disappointed more often than not. Now that I've had the chance to see (and taste!) for myself, I understand what they were all talking about...these are easily the best cashews I've ever had, with a truly unique flavor profile and a level of overall consistency that makes them a singular standout. Further, my delivery was very fast, the customer updates were timely and the re-sealable bags really work. I liked this product so much that I next ordered more cashews as well as pecans, macadamias and pistachios. You should be proud of your great quality product and the way that your business is handled as well, kudos! ProsProduct Quality Product Size Consistency Storage bags that work. ConsMy wife started eating them too, and that never happened before, so my entire inventory control has to be re-structured.